Socca are flat breads from the Nice area of France. Made with garbanzo bean flour, cooked in a screaming hot oven until they blister and brown, sprinkled with salt, pepper and sometimes a bit of olive oil, these tasty bits are simply delicious. I call these “sorta socca” because I use different kinds of flours and add seasonings and herbs to the mix before cooking. Traditional socca are simply flour, water, oil and salt. David Lebovitz writes a great recipe for socca in his book Sweet Life in Paris and has another post about it on his blog. Check those out too. He gives some great information. For the most part, this recipe is based upon Davids recipe. Final seasonings: Freshly ground black pepper, sea or kosher salt, slight drizzle of olive oil which is totally optional. Special equipment: Sturdy heat-resistant pan such as cast iron or steel. 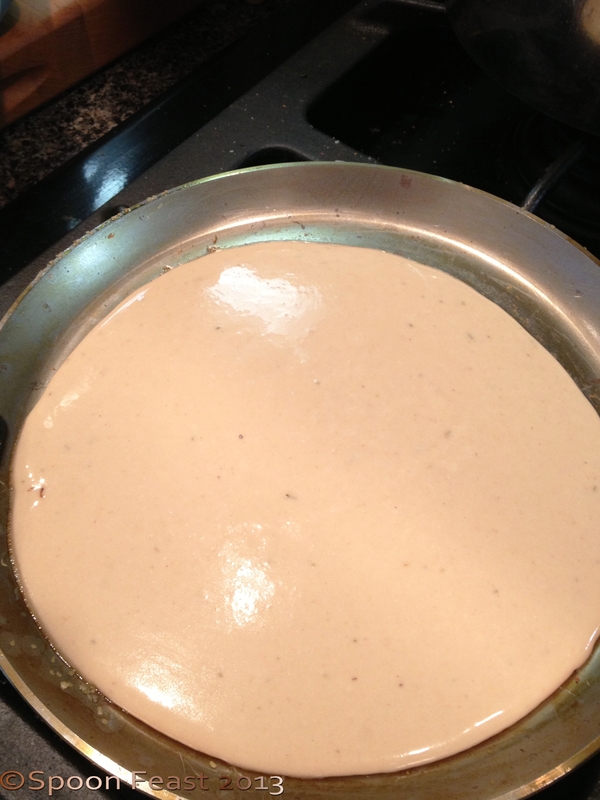 I use a crepe pan I bought in Paris and it works great! Just be sure there are no plastic handles on the pan you choose. A sturdy tart pan would work well, cast iron, although heavy, is ideal. Here is some advice: if you go researching recipes and cooking methods you will find some call for cooking in a 450°F oven for 10-12 minutes. Please take my advice and realize this is not hot enough. Use the broiler on high or use your grill if you can get it that hot. To prevent the oil from burning on the pan, as it would if you were to pre-oil and then pre-heat the pan under the broiler, oil it just before you pour in the batter. Mix all the ingredients together and allow the mix to sit for a couple of hours. This allows the flours to hydrate. 15 minutes before you are going to cook the socca, turn on the broiler and place the pan in the oven to get screaming hot. When the oven and the pan are really hot, pour enough batter into the pan, swirl it around and place the pan back under the broiler. Make sure there is room for the socca to rise while it is under the broiler, if it touches the heat source, it will burn. You will see the dough puff and begin to turn brown. This only takes a few minutes and how long depends totally upon the strength and heat of your broiler. 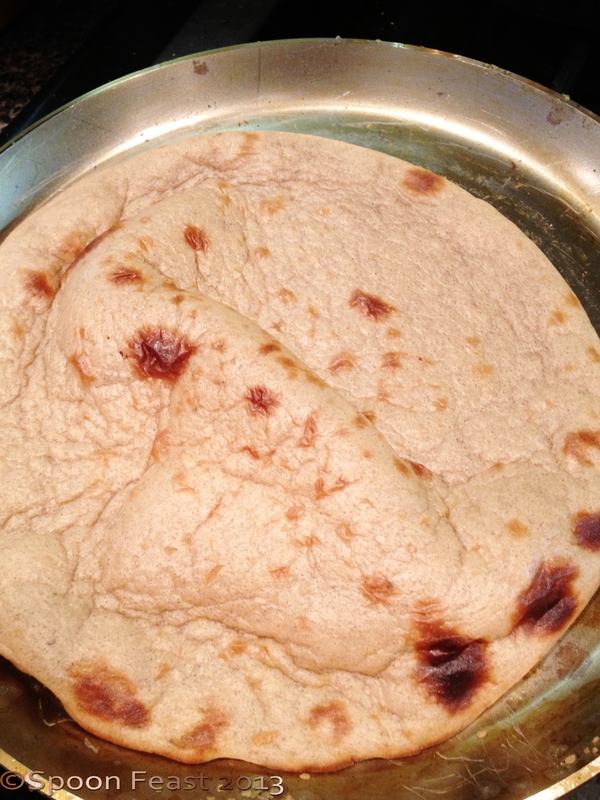 The socca is done when it is dark brown to black around the edges and the top has golden brown spots. Remove from the oven, place the socca on a cutting board, sprinkle with salt and fresh black pepper and a drop or two of olive oil. Socca is meant to be rustic so either tear it into serving portions or cut it into wedges. Put the warm socca on a rack to cool so it does not become soggy. Sometimes I’ll re-warm any left-over socca by placing it on a hot pizza stone on the oven for a few minutes. This tastes so good warm! 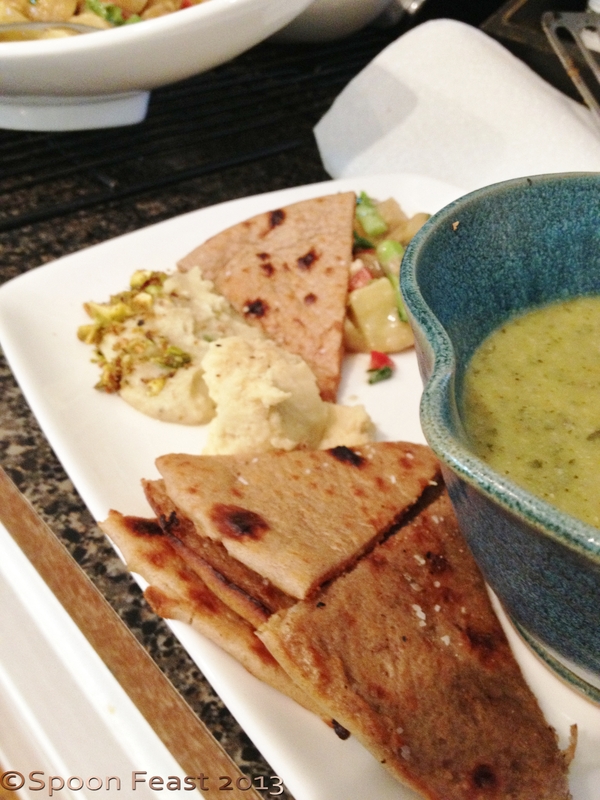 Today’s socca was served with lemon hummus, baba ganoush and cabbage cruciferous soup. If you have no idea what socca is, try it. I encourage playing with flour mix. 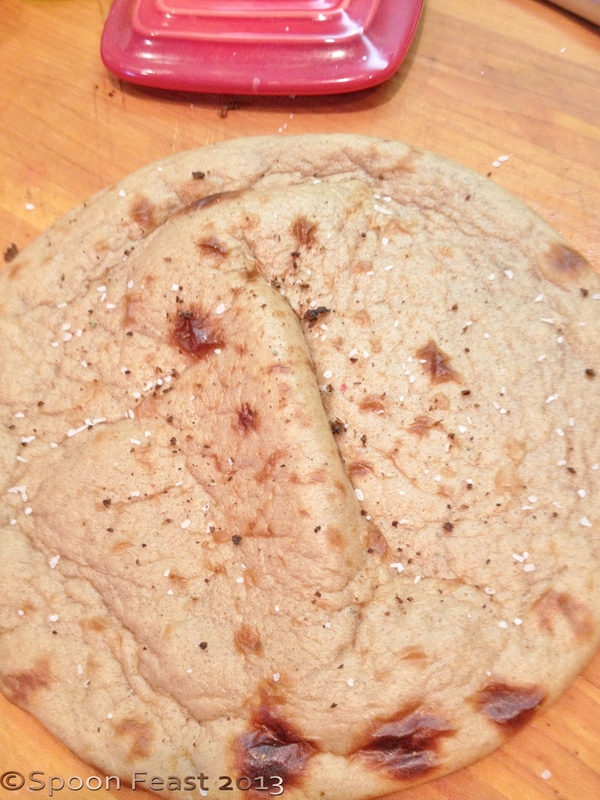 While traditional socca is made with garbanzo bean flour, you can mix it up a bit with other flours too. An added bonus is this is also gluten-free unless you decide to use some wheat, rye or barley flours. If you do know what socca is, while not quite the same as the street food in Nice, this comes pretty close. 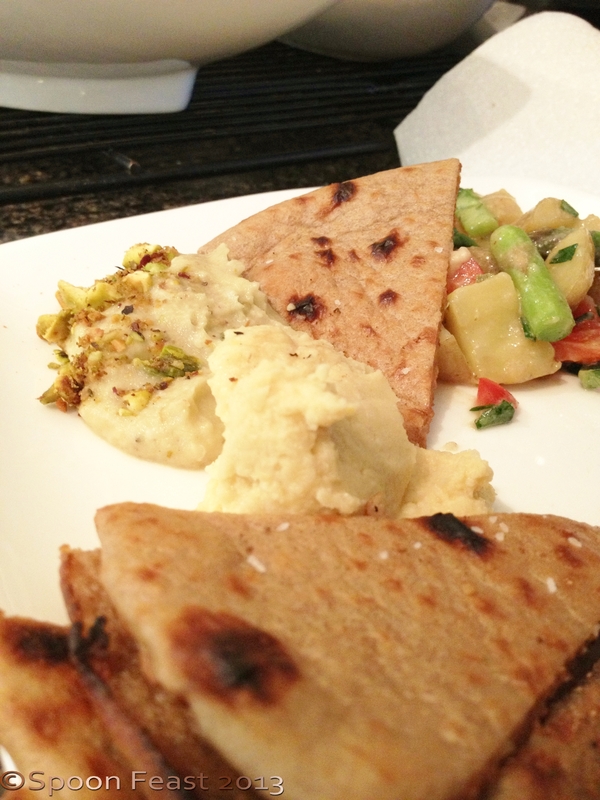 This entry was posted in Cooking, Recipes and tagged Black pepper, brown rice flour, chick pea flour, Chickpea, cook, Farinata, flat bread, Flour, gluten free flat bread, socca, vegetarian. Bookmark the permalink. I’ve always wanted to make these but everytime I go to make them my chick pea flour has gone rancid. I need to buy some more and store it in the fridge!!! Thanks for reminding me about these! I keep my flours in the freezer well wrapped. Rancid flour is so disappointing when you really want to make something and chick pea flour seems to turn south rather quickly. I hope you make these, let me know how you do!